John Michael Crichton knew at a young age that he wanted to be a writer, but he trained to become a doctor. In 1969, the same year he recieved his MD from none other than Harvard Medical School, he published what would become his first of many massive hits, a novel about the outbreak of an unknown and lethal pathogen recovered from space: The Andromeda Strain. This novel launched the career of one of the biggest names in popular science-fiction, and it set the basic template for Crichton's future successes, including The Terminal Man, Sphere, and of course, Jurassic Park. I grew up reading anything and everything Michael Crichton published, and the man was inarguably one of the greats among science entertainers. However, as an adult, I'm a little put off by his formula and the meta-text it represents. Roughly speaking, Crichton follows the Frankenstein formula, one in which science runs amok to the detriment of mankind. If I may be permitted to skip all the way to the final chapter of The Andromeda Strain before I discuss the rest of the book, it ends with NASA putting an indefinite hold on all space travel because of the dangers represented by the titular infection. Most of Crichton's stories have similar denouments, and in aggregate, it makes one wonder if Crichton is genuinely a science popularist or if he is just a technological alarmist. Consider that The Andromeda Strain hit store shelves just two months before Apollo 11 landed on the moon. While the rest of the nation was cheering the success of the space program and being inspired to look to the future, Crichton's book was convincingly arguing that people were too fallible to be trusted to take the necessary precautions should something unexpected happen, like a space bug hitching a ride on a satellite and falling to Earth. This is because Crichton is also a believer in chaos, of seemingly innocuous random events coming together at the worst possible time to cause the worst possible outcome. This isn't precisely the same thing as Chaos Theory, popularized in the 1960's by Edward Lorenz and Benoit Mandelbrot, but it was close enough for Crichton's own character, Ian Malcolm, to conflate the two in Jurassic Park. However, it is present in Crichton's earliest works, and used to great effect in The Andromeda Strain, where one character's latent epilepsy, an undetected printer jam, and an engineering snafu, among other things, coallesce into a series of events that end with a potential nuclear detonation. This makes for thrilling reading, to be sure. One of the reasons Crichton remains so popular is his ability to grab the reader's attention and hold it through suspense, mystery, and action. This is also why almost all of his novels have been turned into Hollywood blockbusters, because they are just so gripping and full of excitement. 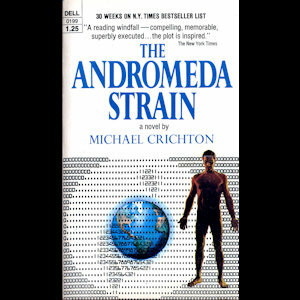 The Andromeda Strain, in lesser hands, could be a boring and exhausting read, full of mind-numbing technical details and outrageously silly plot beats that feel contrived, but Crichton makes it all interesting and plausible. One of the tricks he deploys in The Andromeda Strain is in presenting it as a report, written after the fact, concerned with explaining how everything happened. This allows him to set up the dominoes of his plot while making sure the reader knows they are important, long before he tips the first one over to start the action. Without this conceit, the plot would feel too random and contrived, but with it, the reader is eased into things through an effective cushion of post hoc realism. After all, in the real world, all manner of accidents and disasters occur or are made worse by random chance, human error, and freak coincidence. While the narrative of real life is often far too messy for fiction, when a narrative is presented as the accounting of a disaster, it feels all too familiar. Crichton also draws from his strengths in this novel--namely his medical training--and imagines a world where medical technology is far more advanced than it was in 1969 (and, in a couple of ways, more advanced than it is today). He layers on believable clumps of bureaucratic politics and government paranoia, and then tops it off with characters who, despite their similar backgrounds, all feel unique and interesting in different ways. The primary protagonist of the book, Mark Hall, is a surgeon, and Crichton no doubt encountered many surgeons at Harvard who inspired the character. There is some neat science and good speculation to offer as well. 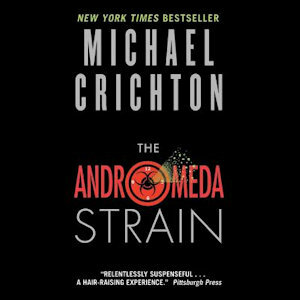 The main gimmick--the possibility of bacteria going into space from Earth, getting heavily irradiated, undergoing massive mutation, and then returning as something terrifying--is so well-reasoned, one wonders why it hasn't happened in the sixty years since The Andromeda Strain was published. Crichton is also adept at explaining complex subjects in laymen terms (things like protein folding, electron microscopy, and metabolic alkalosis) while simultaneously making them both interesting and relevant to the plot. Few writers, even among the science-fiction greats, are as good as Crichton at explaining scientific and technological concepts. All that said, The Andromeda Strain also has a few problems. First among these is the conclusion (spoiler alert: the disease, whatever it is, mutates into a harmless form and, for reasons that are never explained, the virulent form disappears), which feels cheap. Second is the lack of explanation. With so much detail going into setting things up, it seems lazy for Crichton to end without ever telling us what the Andromeda Strain actually is or where it really came from, why one of the "immune" characters was able to transmit the disease even though the explanation for his persistent immunity involved the disease mutating too rapidly to damage his brain, what caused the mutation if the strain didn't require DNA because it didn't have any amino acids, etc. It's a fun ride, but if you don't get off once you've finished reading, it starts to fall apart on you. 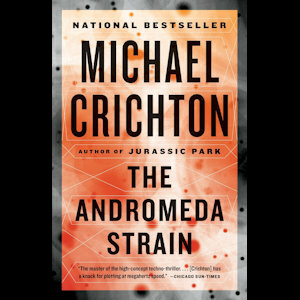 There can be no doubt that Michael Crichton was a gifted storyteller whose work will stand the test of time for generations to come, and it all started here, with The Andromeda Strain. It's not Crichton's finest work--rare is the writer who starts a long career with their best novel--but it creates the mold from which his best work is formed. In the next article, we'll take a look at Robert Wise's 1971 film adaptation, the first of many movies based on Crichton's work.